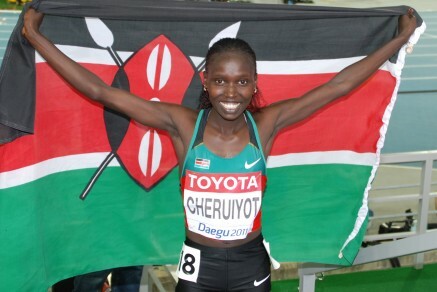 Vivian Cheruiyot won the IAAF 5000m Diamond Race in the Memorial van Damme meeting in Brussels beating training partner Linet Masai into second place with a fast last lap. The 5000m World Champion played a waiting game, only taking the lead in the last kilometre to stop the clock at 14:34.13 with a 61 secs last lap. Masai finished strong in the final 100m to overhaul Ethiopian Ejigu for 2nd clocking 14:35.07. Leo Manzano (USA) showed excellent closing speed to finish 2nd in the 1500m in a personal best 3:32.37 behind Olympic Champion Asbel Kiprop (KEN). This is Leo’s third personal best in 3 weeks with a mile PB of 3:50 in London, 800m PB of 1:44 in Berlin and now the 1500m PB of 3:32 in Brussels. He will run next week in the IAAF Continental Cup in Split. Tom Lancashire (GBR) tracked Manzano for much of the race smashing his personal best with a time of 3:33.96 for 5th place. This time is the 11th fastest ever by a British athlete and 2nd fastest European this year. Stephanie Twell (GBR) took 25 seconds off her personal best in the 5000m running 14:54.08 in 11th position. The 21 year old moves to 4th on the British All-Time list behind Paula Radcliffe, Jo Pavey and Zola Budd and bettered the Scottish Record times of Yvonne Murray and Liz McColgan. In his first ever race in Europe 17 year old Albert Yator took 10 secs off his personal best in the 3000mSC with a time of 8:23.69 in 5th position.